The evolving threat landscape continues to elevate the visibility of information security within organizations. To be an effective leader, you must have business acumen and expertise in security, technology and process. Optiv can provide the knowledge and tools you need to advance your program’s maturity. 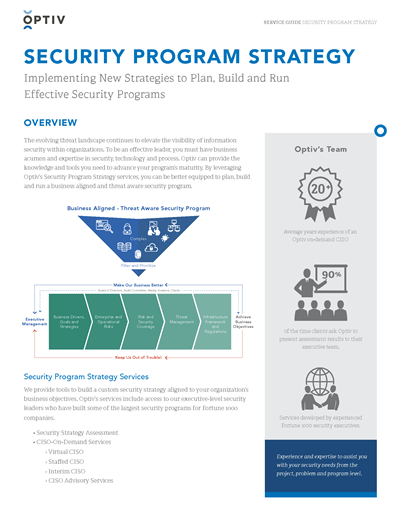 By leveraging Optiv’s Security Program Strategy services, you can be better equipped to plan, build and run a business aligned and threat aware security program.